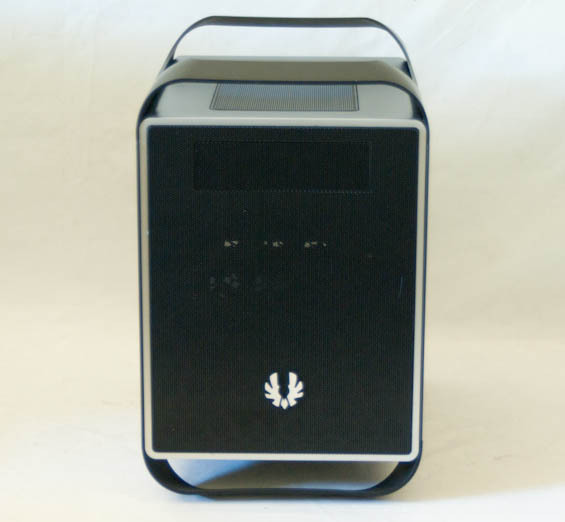 You could be forgiven for mistaking the BitFenix Prodigy for a tiny plastic-and-steel Mac Pro tower. The Prodigy isn't quite as small as some Mini-ITX cases are, but it's still a remarkably wee enclosure for the expandability it provides. The front of the Prodigy is entirely plastic mesh except for the BitFenix logo, including the shield for the single external 5.25" bay. It's a clean design, but given the soft plastic handles and supports of the enclosure (more on those in a second), it means that the power button, LEDs, and I/O cluster had to go somewhere else. That somewhere else is the right side panel; this won't seem too unusual to users familiar with some of Lian Li's designs, but it does limit how you can place and orient the Prodigy. As for the left side panel, that simply includes a substantial vent to help cool full-length video cards. When the BitFenix rep asked me what I thought of the Prodigy, I did point out that I wasn't a fan of the plastic handles and supports. If you look at the photos, you can see the bottom supports bow in a little bit. This is by design, but the problem is that the material feels too flexible and I don't think it's quite stable enough on carpet. It's easy to get the case to rock back and forth, something I'm not fond of when a desktop build often includes things like optical drives and mechanical hard disks. The justification was that using the soft, flexible plastic keeps the weight of the Prodigy down (and probably costs along with it), but I personally would've taken an extra couple of pounds if it meant a more stable support. 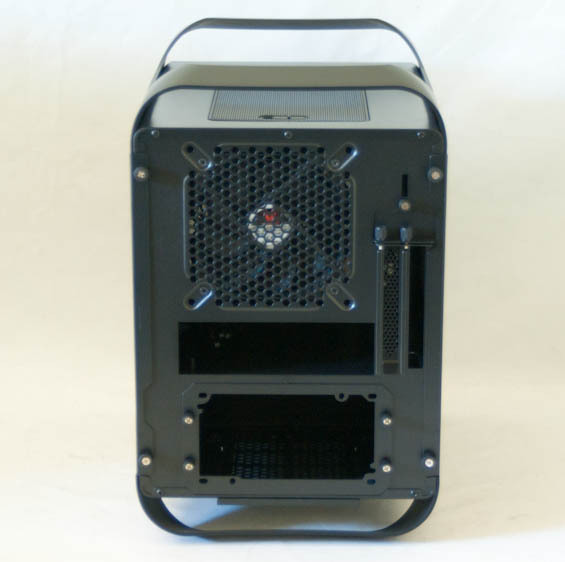 The top features a lockable, removable 240mm vent for accessing the two mounts on the top of the case. Moving to the back of the case, we can start to get an idea of how BitFenix intended the Prodigy to come together. The power supply bay is almost dead center of the bottom, and there's a removable faceplate for it to allow you to slide the PSU in from the back. Having the supports give the bottom of the case some clearance is perfect for the PSU air intake--necessary, really--but again I wish they were sturdier. There are also a pair of expansion slots held in place by thumbscrews, and the exhaust fan mount is equipped with a 120mm fan but is capable of supporting 140mm. Taking the side panels off is as easy as removing the four thumbscrews on the back of the case, but in the process we discover what I consider one of the major flaws of the design: the I/O cluster in the right panel is completely mounted to the panel itself. This runs the risk of making the Prodigy harder to wire than it needs to be. There are also two 2.5" drive bays built into the side panel, again complicating wiring but not as much. The interior is pretty ingenious, though. The standoffs for a mini-ITX board are already in place, and there are holes in the left and right of the tray for routing power cables from the power supply mounted below. 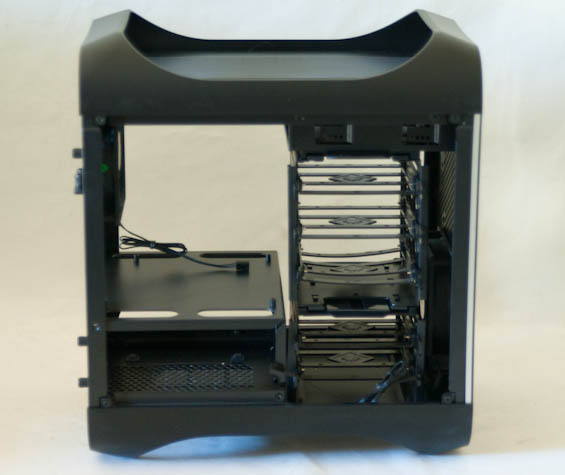 The primary drive cage is also very easily removable by simply squeezing the two plastic levers, and the included instruction manual details how virtually all of the drive cages (including the bottom one and the optical drive bay) can be removed. Frankly, I quite like how the Prodigy looks and feels. Apart from two issues at first sight (the material used for the handles and supports and the I/O cluster being mounted to the side panel), this promises to actually be a fairly easy assembly given we're dealing with a mini-ITX case. More than that, it's the kind of case that pretty much begs to be tinkered with.